Coal Tar is a thick, black, sticky liquid that is often used to protect and preserve asphalt surfaces such as parking lots, playgrounds and residential areas. Coal tar is a recognized carcinogen by the National Institute of Health and contains high levels of polycyclic aromatic hydrocarbons (PAHs) which are toxic to both humans and animals. PAHs are chemicals formed from the incomplete burning of organic materials such as coal, oil, and gas. 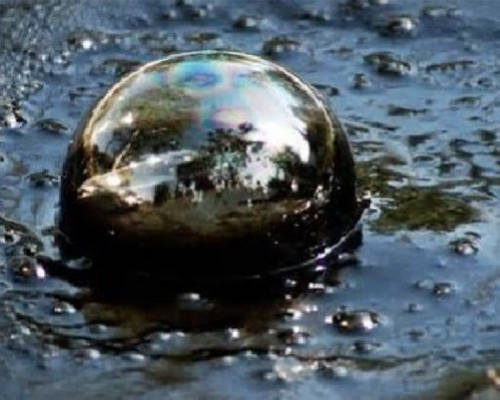 Various harmful PAHs like those found in coal tar based sealcoats are carcinogenic and known to cause serious health risks such as lung, skin, bladder and gastrointestinal cancers. Why do PAH Levels in Pavement Surfaces Matter? PAH concentrations in coal tar sealcoats are over 1,000 times higher than asphalt-based sealcoat products such as GuardTop®. These chemicals do not permanently stay on the pavement surfaces they are applied to. Friction from vehicle tires and foot traffic chips the sealcoat into small particles that are then swept into storm drains. These particles can also be tracked onto other surfaces through tires or wind and can even be tracked indoors on the soles of shoes. Homes that have neighborhood roads or driveways paved with coal tar sealcoats have PAH concentrations in house dust that are more than 500 times the amount in homes near asphalt-based pavements. Exposure to PAHs can be especially harmful to small children that spend their time playing on the floor and often put their hands or objects into their mouths. Contact with harmful chemicals can also occur when children play on playgrounds or in neighborhoods that are paved with coal tar. Coal tar based sealcoats were the largest source of contamination in 40 urban lakes studied by the United States Geological Survey. Particles that are chipped away through water runoff are carried down storm drains and into streams, lakes and rivers. Since their ban of coal tar sealants in 2006, Austin, Texas experienced a dramatic decrease in PAH levels in lakes and other bodies of water. Prolonged exposure to PAHs found in coal tar are linked to blood, kidney, liver, lung, skin and stomach cancers. Skin contact, inhalation and ingestion are the main ways that individuals can be exposed to harmful PAH chemicals. These pathways of exposure are especially of concern for individuals that apply coal tar sealcoats. These workers are often subjected to harmful chemical burns and toxic inhalation of fumes and particles. Many individuals are exposed without even knowing that the ground beneath or around them is covered in harmful materials. How does Coal Tar Impact the Environment? Aquatic environments such as lakes and rivers are highly susceptible to PAH contamination. Fish, amphibians, insects, small creatures and plants are the most vulnerable to the effects of toxic coal tar. Aquatic organisms that are downstream of coal tar contaminated water runoff are subject to birth defects, tumor growths, difficulty swimming, stunted growth, liver problems and even mortality due to high PAH concentrations in their environment. GuardTop® sealcoat products have always been, and will always be, completely free of coal tar and harmful PAH. Products are made from 100 percent asphalt base stock and are environmentally sustainable. GuardTop is a safer and cleaner alternative to harmful, toxic sealcoat products that contain coal tar or other dangerous additives.